The Vancouver Condo Buzz » REGISTER NOW! It’s Time > Trapp+Holbrook New Westminster Condos by The Salient Group > Starting from just $219,900 > Modern Living in Historic Neighbourhood > GET VIP ACCESS! « OUR TOP 3 LISTS! Here are our favourite new Lower Mainland condo projects in Vancouver, Burnaby, Metrotown & Richmond Real Estate Markets! REGISTER NOW! It’s Time > Trapp+Holbrook New Westminster Condos by The Salient Group > Starting from just $219,900 > Modern Living in Historic Neighbourhood > GET VIP ACCESS! SPECIAL OFFER > $20,000 OFF ANY SUITE FOR A LIMITED TIME ONLY! 20 storeys of panoramic view homes at New West Trapp + Holbrook start from just $219,900! Full disclosure, The Salient Group is one of our top 3 favourite developers in the Lower Mainland. Some of the spectacular amenities on site at the historic New Westminster Trapp and Holbrook condo building includes: lushly and professionally landscaped garden terrace, community garden plots, fireside lounte seating area and an outdoor BBQ and dining area. As well, residents at the New Westminster Trapp and Holbrook condo building can enjoy the raised, river-view sundeck, club lounge/games room for celebrating and entertaining and the fully equipped fitness gym. The homebuyers at the Trapp and Holbrook New Westminster condo building will also enjoy panoramic Fraser River views from most suites starting from the fifth floor and up in addition to the carefully resotred building façade from the original Trapp and Holbrook Blocks from 1913! All homes at Trapp and Holbrook New Westminster real estate market will feature the 2-5-10 Home Warranty by Travelers in addition to key fob security entry to parking garage, storage lockers, elevator and amenity spaces. One of the tallest buildings on Columbia Street New Westminster during the Edwardian era, the landmark Trapp Block formerly housed warehouses and offices while the Holbrook Building next to it had a hotel and saloon which was constructed in the 1880s and rebuilt after the Great Fire in 1898. 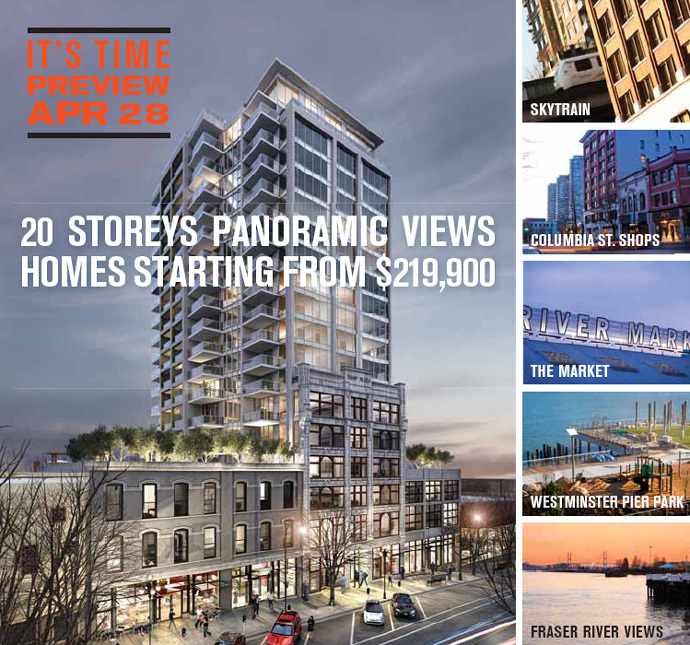 It’s time for modern living in historic New Westminster! Visit thliving.com for more information. The Holbrook Suites from Levels 3 to 7 include 1 bedrooms (A4, C3, C4) between 598 to 714 square feet between the price range of $261,900 – $324,900 and the 1 bed suites (H2, H2 and H5) between 549 – 779 square footage between $234,900 and $263,900. The 1 bedroom plus den floor plans at Trapp+Holbrook New West Holbrook Suites include several H plans between 619 to 808 square feet and between $277,900 – $319,900. The Tower Suites at Trapp & Holbrook Condos in New Westminster real estate market includes A layouts (1 bedroom) between 496 to 522 sf and between $219,900 to $277,900 as well as B plans between 504 to 516 sf between $255,900 to $279,900. 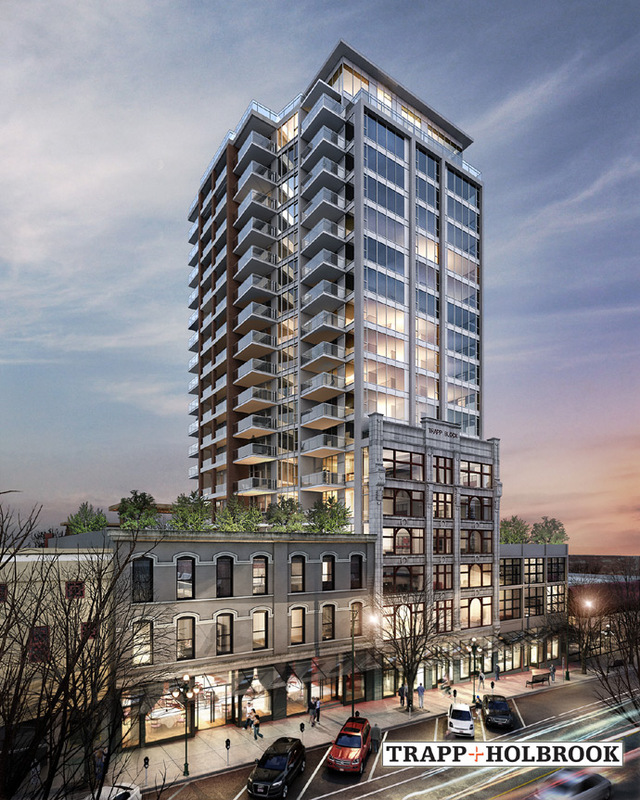 The C and D Tower Suites on levels 5 – 19 at the New Westminster Trapp & Holbrook condo tower features plans between 580 to 600 sf and between $270,900 to $308,900. The E & F floor plans at Trapp+Holbrook are 2 bedroom units between 766 to 913 square feet and are priced between $339,900 to $434,900. The G1 and G2 Trapp+Holbrook New Westminster floor plans are 1012 square foot two bedroom plus den layouts and are priced between $421,900 to $491,900, pricing dependent on the floor. The Trapp and Holbrook New West Penthouse Suites on Levels 20 and 21 are simply amazing and includes the Sub Penthouse Units 2 bedroom and 2 bed+den floor plans between 875 sqft to 1081 sqft and priced between $439,900 to $569,900 as well as the Trapp + Holbrook New West Penthhouses between 1038 to 1265 square footage (2 bedroom and den floorplans) priced between $579,900 to $649,900. Visit thliving.com for more information. The kitchens at the spectacular New Westminster condos for sale at Trapp+Holbrook building will include a designer appliance package by KitchenAid Architect Series II convection wall oven, built in microwave unit and ceramic glass cooktop in addition to the KitchenAid Specialty Series slide out hood fan and KitchenAid Classic Series integrated console dishwasher. All homes will also feature high-end Blomberg bottom freezer fridge, which is built in with integrated cabinetry doors. Also in the kitchens at the New West Trapp+Holbrook Condos for sale include the Delta “Trinsic” single lever chrome faucet with pull out spray, under mount stainless steel rectangular sink (single bowl) and high-end quartzite counters with glass mosaic tiled backsplashes. Also, the new Trapp+Holbrook New Westminster condos will feature Walnut Wood Grain laminate or Frosty White matte finish cabinetry with chrome pulls. The bathrooms at the New Westminster Trapp+Holbrook condos for sale will include deep soaker tubs with ergonomic back incline (main) and Acri-tec Zen integrated acrylic basin and countertops in main. The ensuite bathrooms will feature semi-frameless glass enclosed showers as well as quartzite counters with six inch matching backsplashes and rectangular undermount basin. The bathrooms at the Trapp+Holbrook New Westminster condos for sale will also feature Delta Vero single lever chrome faucet and tub filler, shower head and trim. All bathrooms will have soft closing mechanisms and dual flush feature and the cabinetry is similar to that found in the kitchens. The interiors of the New Westminster Trapp and Holbrook condos for sale is designed by award winning and internationally acclaimed Cristina Oberti Interior Design Inc and the efficient/functional floor plans are there to maximize your space and natural light. The bedrooms have high quality loop carpets while the main living areas have engineered laminate wide plank hardwood floors. All homes at Trapp and Holbrook New Westminster condos will have washer/dryer in laundry closets and floor to ceiling windows. Visit thliving.com for more information.